The image of your child and dog as inseparable, best friends is a great one that we'd all love to be reality. With the right awareness, our children and pets CAN have the wonderful relationships we hope for. Here are some tips that all families with children and dogs will want to know. 4.7 million people are bitten by a dog each year according to the American Veterinary Medical Association. No child under age five should be left alone with any dog. Not even for a minute. The age may be even older depending on personalities. Young children do not yet understand that a particular action may be hurt a dog. Their innocent tail pulling could lead to aggression or fear and become a recipe for disaster. Supervise all young children when around dogs, even the most gentle pet. Research which breeds best suit your family. Pay attention to genetics. Just because you pick a Golden Retriever doesn't mean he will be exactly like your neighbor's Golden Retriever. Assess the dog's personality and that of his parents. All puppies should go through a puppy socialization class. More time invested with your new puppy now will make him a cherished member of your family for years to come. If you have an older dog, it's not too late. All dogs will benefit from training. Have the whole family attend the classes. This way, everyone will know the same commands and how to enforce them. Training will be much more successful if you're all on the same page. Consider using a Gentle Leader or Halti when walking and training your dog. These are head collars that use gentle pressure. They are wonderful for controlling pulling and even a small child will be able to walk the dog safely if used correctly. Neutered dogs may be less likely to bite. 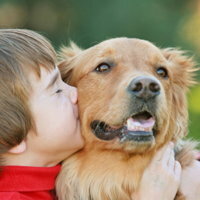 Dogs can harbor parasites that are of particular concern to children. Hookworms and roundworms can be transmitted to people. In some cases, they can even lead to blindness in humans. Hookworms and roundworms are intestinal parasites that dogs get from the ground where other infected dogs have defecated. Children are more prone to ingesting the worm eggs and larvae unknowingly. Infected dogs will shed eggs and larvae in their stool. A child who has played in that area is at risk for infection if they put their unwashed hands in their mouths. Keep your dog on monthly heartworm preventative year round. It controls hookworm and roundworm infection in your dog. Ticks can carry diseases, like Lyme disease and Ehrlichia, to which humans are susceptible. The fix for this is to Keep your dog on monthly flea and tick preventative. The risk of an infected tick detaching itself from your dog and attaching to the child will be greatly decreased. Many problems can be prevented by following simple steps. Your children and dogs can have a lifetime of safe, healthy friendship and companionship! Books about dogs have entertained us for decades. Here are some of our favorites! "Staff are polite, I was seen in a timely fashion, and the vets were informative and knowledgeable, and took time with me." "I was introduced to Montrose Veterinary Clinic back in 1996 and have never gone anywhere else. Dr. Ali, and others over the years, have cared for my pets. She is an incredible, caring doctor who goes the extra mile. The entire staff is top notch and I appreciate each and every one. Thank you all so much."